Plush and friendly with a purpose. Highly Recommended. Our California Zinfandel wines are affordable and, most importantly, great-tasting. Our current collection features Zinfandels from Lodi, Sierra Foothills and Mendocino. Get the latest news on what Zinfandelic has been up to in our blog — featuring our groovy tunes playlist. Now you can enjoy wine and music pairings with Zinfandelic. "The nose is of juicy strawberries sprinkled with cayenne pepper. A pleasant note of red cherry and a slight minty character comes through on the palate adding complexity and lightness. A great wine for a BBQ." "Dark violet color. Aromas and flavors of ripe plums and peaches, carob, whole peppercorns, and maple with a satiny, bright, fruity medium body and a smooth, breezy finish with barky tannins and moderate oak. A gulpable Zinfandel for weeknight dinners." "Garnet color. Rich aromas or raspberry compote, vanilla nut fudge, and a mint with a supple, fruity medium-to-full body and a juicy, cherry tart, peppery spice, and cedar finish. A fun, flavorful, and very well balanced zin for all occasions." This big but plush wine is deep in color, rich in blackberry aromas and saturated with ripe jammy flavors that spread across the palate and cling to the sides of the mouth. It is full bodied, very concentrated and has a ripeness that leaves a fruity sensation on the finish. "Bright black violet color. Aromas and flavors of grilled berries, polished furniture, patent leather, green bell pepper, and green peppercorn with a chewy, vibrant, dryish medium-to-full body and an intriguing, medium-length dried mint finish with harsh tannins and moderate oak. A big, zesty Zinfandel; give this one some time to open up." "Red licorice, fruitcake, and spice aromas create an invitingly bombastic nose. In true zinfandel form, there are lush, juicy flavors of raisins, loganberries, and walnut throughout the palate that are emboldened by a hint of baking spice. Plush and friendly with a purpose. Highly Recommended." "Deep purple color. Faint aromas and flavors of nuts and dried berries with a satiny, tart, dryish medium body and a breezy cranberry, dusty spices, and cedar bark finish with cottony tannins and heavy oak. A tart, tannic, and tight zin for the table; give this time"
"Medium red, garnet color; ripe, red berry fruit aroma, sharp and bright; raspberry flavors, zippy and alive; pleasing aftertaste. Smooth, fresh and easy-to-enjoy. Delicious now." "Red brick/garnet color. Raspberry jam, boysenberry aromas are ripe, earthy, jammy, fresh, spicy. Taste profile features the drier, tarter side of the berry fruit as the flavor comes off tannic, bittersweet, slightly tight. Finishes medium long, tobacco-like, leafy." "Ruby color. Aromas of raspberry jam on pastry toast with a supple, dry-yet-fruity medium body and a tangy, firm tannin finish." A Zinfandelic state of mind. A far-out California wine. The Mendocino label, the third label in the series, pays tribute to the same inspiration as the first two labels. The label artwork reflects the rock posters that captured California's cultural movement of the 1960s - Flower Power, Haight Ashbury, Summer of Love, Rock & Roll. To capture this aesthetic we used typography as the main driving focus with accents of color on the icons. The interacting typography pulls you back to the 1960s era and gets you in touch with zinfandelic's California roots. Groovy tunes to enjoy with a groovy wine. It's Zinfandelic! 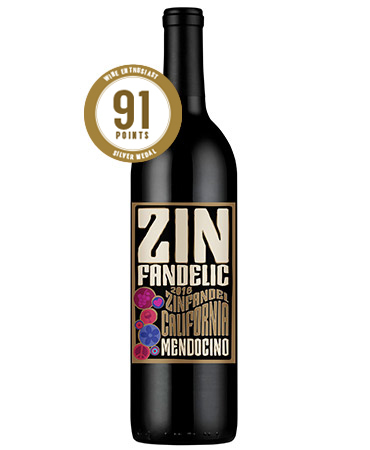 Zinfandelic pays tribute to the quintessential California wine, Zinfandel. The label artwork reflects the rock posters that captured California's cultural movement of the 1960s - Flower Power, Haight Ashbury, Summer of Love, Rock & Roll. We've put together a groovy playlist, inspired by the 2008 Zinfandelic. You've enjoyed wine and food pairings. Now you can enjoy wine and music pairings! Spencer Davis Group - "Gimme Some Lovin"
Vanilla Fudge - "(You Keep Me) Hangin' On"